Scroll down for a Leo Profile, and links to related images. 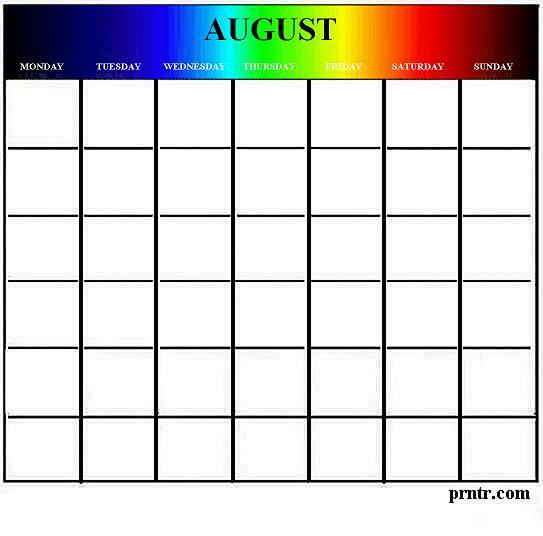 Shown above is a reusable calendar for the month of August, on which you can fill in your own dates and years. Birthstones that represent the month of August are the Peridot and the Sardonyx. Signs of the Western Zodiac for the month of August are Leo and Virgo. The month of August features more noisy insects than any other month of the year. August is the busiest month of the year for business owners in America. Three U.S. states were founded during the month of August - Colorado, Hawaii and Missouri. The first Sunday in August is informally known as Friendship Day. The first full weekend in August is celebrated as Twins Day in Twinsburg, Ohio. This event boasts the largest congregation of twins in the United States. To print this eternally reusable August calendar, simply right click on the image and select the appropriate SAVE option from your drop-down menu. This will save it to your picture file for future use. From there you can reduce or enlarge the image as needed for best printed results. To see a wider assortment of tattoos, clipart, calendars, poetry, profiles, and more, visit any link on this page. Leo is the fifth astrological sign of the Western Zodiac, originating from the constellation of Leo. The sign of Leo is symbolically represented by a Lion. Leos are generally believed to be strong, passionate, energetic and optimistic, possessing a great zest for life. Leos have an air of royalty about them. They are warm hearted, and driven by a desire to be loved. Many Leo people love to be the center of attention, and they often participate in performing arts. On the down side, Leos can sometimes be domineering and egotistical. Many Leos believe that if you want something done right, you have to do it yourself. Leos are often known to be highly creative and fiercely ambitious. Leo personalities are considered most compatible with people born under the signs of Aries, Sagittarius, Libra and Gemini.